Ads for Split Second promoted the game’s ability to continually challenge players. 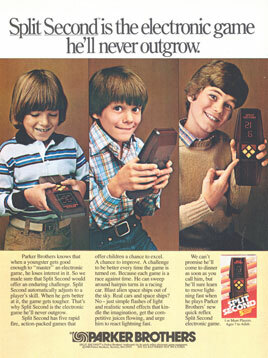 Released in 1980 by Parker Brothers, Split Second was a follow-up to the wildly successful Merlin – The Electronic Wizard handheld electronic game. 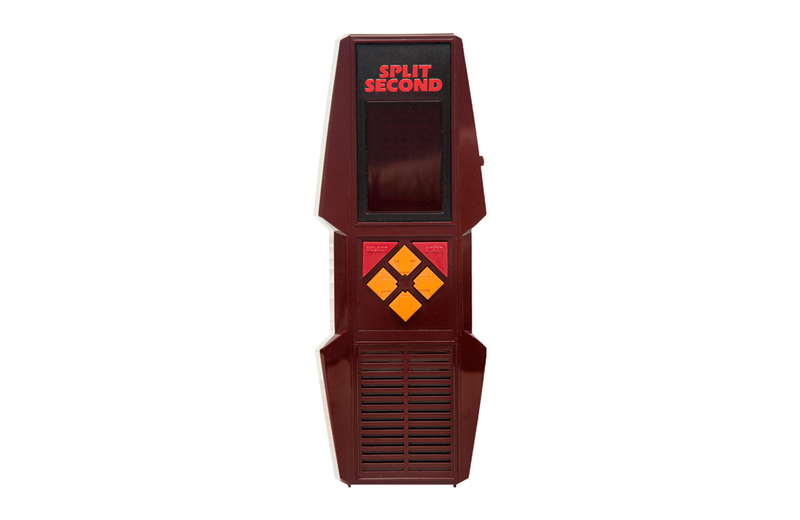 Split Second features 5 games: Mad Maze, Space Attack, Auto Cross, Stomp, and Speedball. Mad Maze and Space Attack offered advanced-play variations, bringing the total number of gaming options to 8. Each game utilizes a varied mix of LED dots and lines. Players control the action through four yellow directional arrows below the screen. Red Select and Start buttons allow for easy game selection. A built-in speaker below the buttons provides audio prompts to indicate when a game has started, ended, and whether a player has won or lost. And how do you win or lose in Split Second? True to its name, the modus operandi is all about time. While the theme and rules of each game vary, the object is always to finish in the shortest time possible. 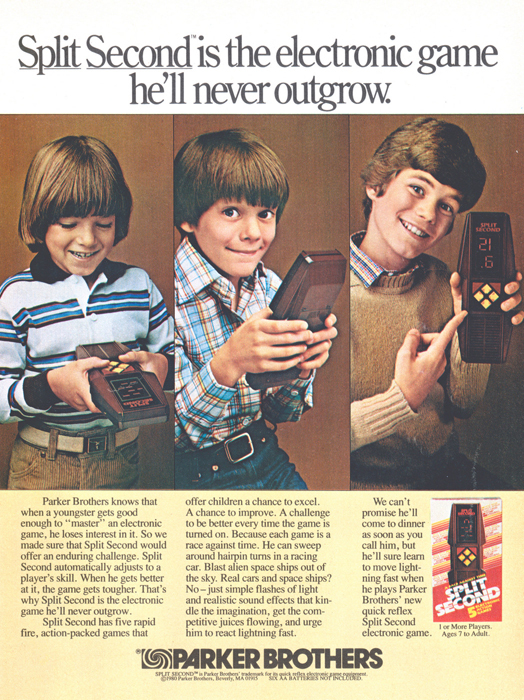 Using time as the primary variable allowed Parker Brothers to tout the game’s ongoing challenge and appeal to a target audience (kids aged 7 to adult) with increasingly shorter attention spans. Split Second reinforces this notion with a simple “Best Score Yet” feature that remembers and displays the best score in real-time for the current game being played. Several of the games also adjust their speed based on time elapsed – increasing speed for players who display quick reflexes and skills.